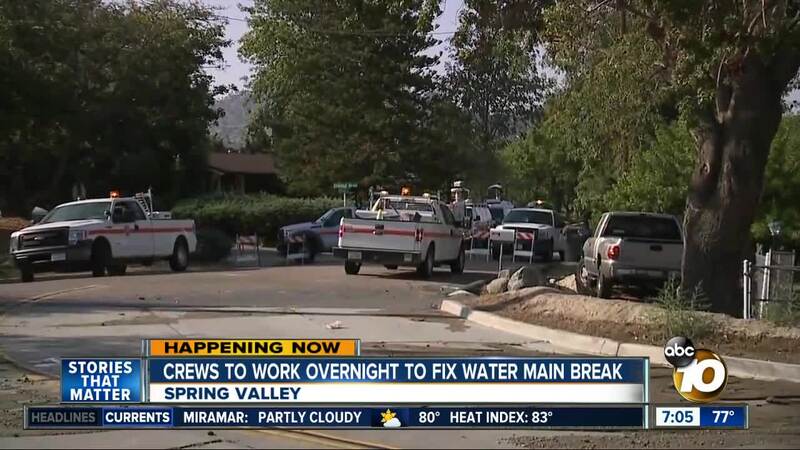 SPRING VALLEY, Calif. (KGTV) - Seventeen homes in Spring Valley were without water Friday night, after a water main break. The homes were mostly along Rothgard Road, according to officials with the Helix Water District. An 8-inch water main broke near Harmony Lane and Cristobal Drive around 3:30 p.m. Crews turned off the water before 4 p.m. to begin repairs. There was a water truck brought out for families impacted by the water shut off. Crews expect to have repairs completed, and the water turned on again by the Saturday morning.